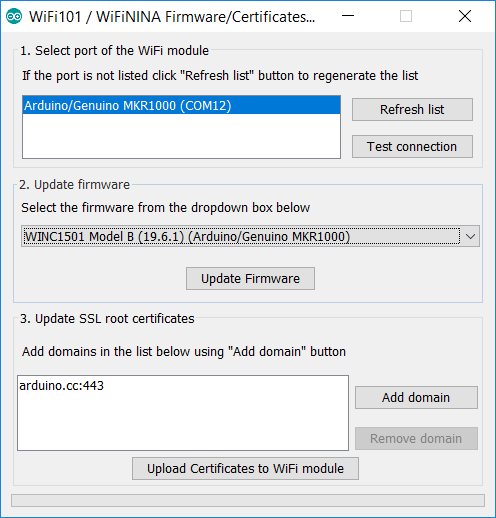 This tutorial will guide you in the process of updating the firmware or loading certificates on your MKR1000 board or WiFi Shield 101. 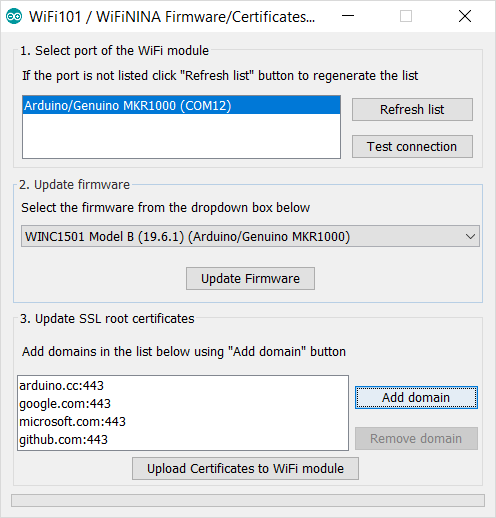 If the Check WiFi101 Firmware Version tells you that you may have issues because the firmware and library versions do not match, here is the solution to align them. The board should be connected to the USB port of the computer ready with Arduino Software (IDE) 1.6.10 or later. The 19.6.1 firmware is only available for model B of the WINC1500, this is used in the MKR1000 board. Unfortunately, the WiFi101 shield uses model A, which Atmel has stopped supporting, so there is no 19.6.1 firmware release for it, 19.4.4 will be the latest firmware version that is compatible. To simplify the process, we have prepared a specific sketch - this FirmwareUpdater - that you must load on the host board (either the one with the shield plugged in, or the MKR1000 itself) and an easy to use plug-in available in Arduino Software (IDE) 1.6.10 onwards. Upload the sketch and keep the board (either the one with the shield plugged in, or the MKR1000 itself) connected to the computer. Once done, open the plug-in that is available in the tools menu. Your board should be in the list of the available serial ports. If not, please check that it is properly configured in the Tools menu. To update the firmware you should choose the right typer of board. You can find your model looking at the WiFi module: te first line in the sticker or the last line of the silk print on the right side of the PCB shows the microcontroller model. It can be either MR210PA or MR510PB and the last letter shows yor model accordingly. Choose in the dropdown list the model corresponding to your unit and proceed clicking on the Update Firmware button. A bar at the bottom will show you the progress of the procedure that includes erasing, writing and verifying of the firmware. At the end you get a clear notice of the successfull operation. With the same procedure, you may load root certificates on the WiFi module to access securely specific websites. Your board must be running the FirmwareUpdater sketch to work .The root certificates are issued by a limited number of certification authorities, but it is difficult to know which site is using which authority. To ease your life, we allow you to specify directly the URL to which you need to connect securely, leaving to us the task to download the root certificate. The list you are building is not saved from one session to the next one. It might happen that a few websites share the same root certificate. You don't have to worry about this as we take care of it. The space available on your WiFi module to store the certificates is limited to around 10 certificates that, being issued by a limited number of authorities, should be more than enough for the average projects. 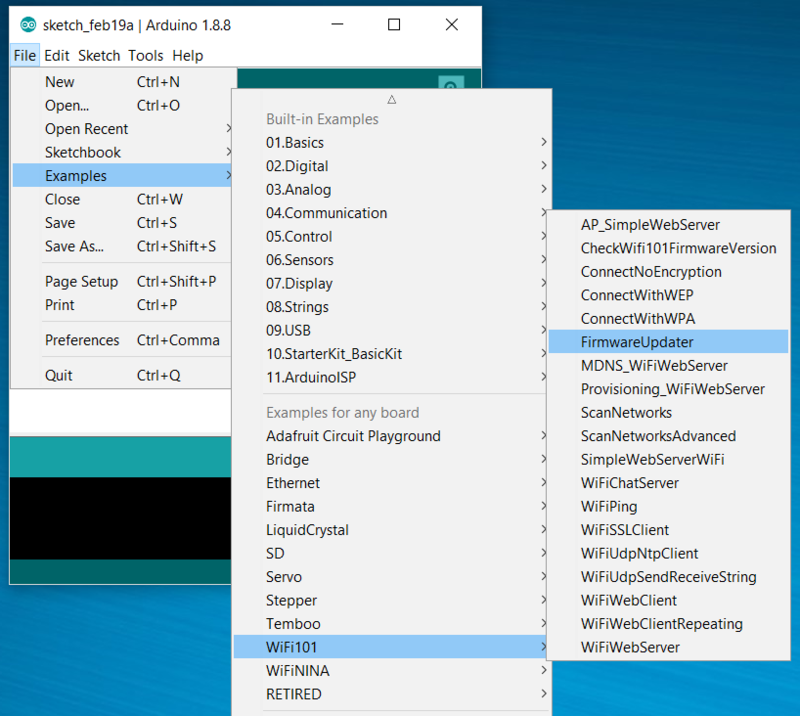 The procedure starts connecting your board (either the one with the shield plugged in, or the MKR1000 itself) to your computer and selecting it from the Tools menu of the Arduino Software (IDE). Load the FirmwareUpdater on the board and launch the WiFi 101 Firmware Updater from Tools and go to the third section of the interface. There you find on the left an empty list and on the right the buttons to add or remove the URL from which you want to download the root certificates. The URL should be exactly the one to which you need to connect. Add all the websites' URLs needed and then procceed with the uploading process. Please remember that you erase all the existing certificates when you load a new set. 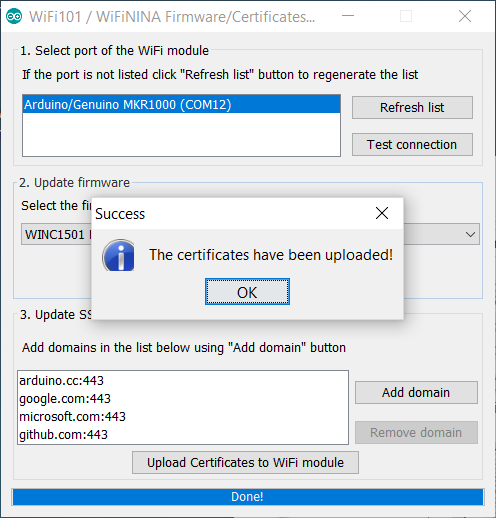 Press the ''Upload Certificates to WiFi module" and wait for the confirmation message. When you load the sketch on the board, it prepares the communication betwen the plug-in and the WiFi chip. It opens up the communication through the serial port to the WiFi module hosted on the board. It is necessary to perform all the procedures managed by the Firmware Upgrader Plugin. Everything will be managed by the plug-in, but it is important to upload this sketch first. 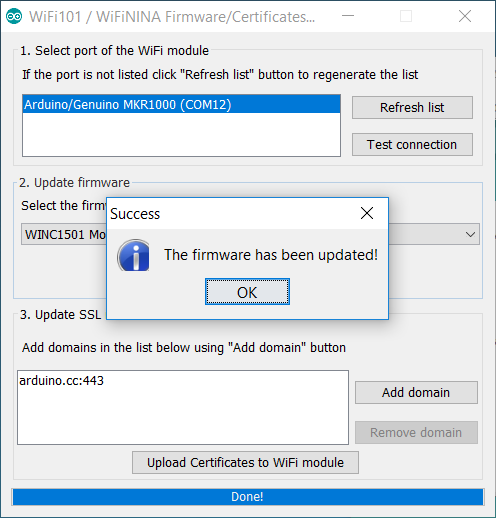 FirmwareUpdate.h - Firmware Updater for WiFi101 / WINC1500. Copyright (c) 2015 Arduino LLC. All right reserved. 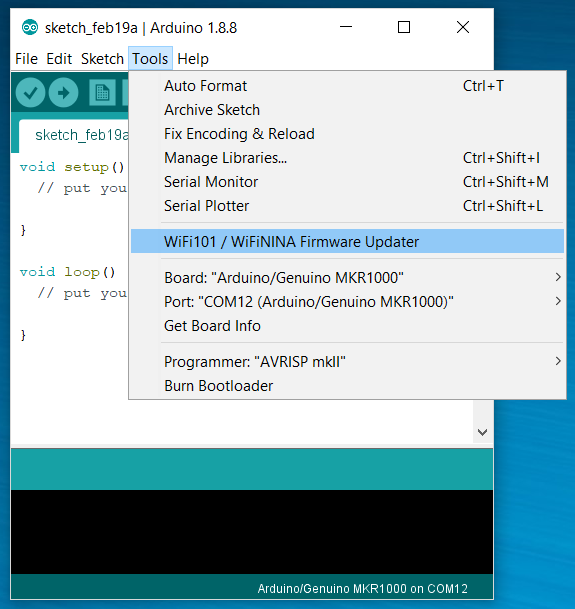 If you are NOT opening the FirmwareUpdater from the examples available in the Arduino Software (IDE) as described in the paragraphs above and wish to copy and paste the code from this tutorial, you need to create another TAB in your sketch and add the Endianess.ino listed below. Endianess.ino - Network byte order conversion functions.